Coffeeneuring Challenge Recap and Guest Post! Hello friends, it’s been a little while. I’m still here, though, and I hope to return to a more regular schedule of blogging soon. Tooday features a guest post from fellow coffeeneur, blogger, and six-time Coffeeneuring Challenge finisher, Vannevar, who has put together some intriguing facts and figures about the latest edition of the challenge. Patches for this year’s challenge have been sent. If you did not receive a patch and believe that you ordered one, please contact me so we can make sure you receive your small piece of coffeeneuring glory. Many thanks to Vannevar for putting this summary post together. Please enjoy! The 2016 Coffeeneuring Season is complete, the patches are sent (and sometimes affixed to panniers and bags), and it’s time for summations and perhaps a bit of review. 2016 saw a few new rules: embracing the Coffee Shop Without Walls, introducing the Home Coffee Shop, and expanding coffeeneuring to every day of the week while emphasizing the Spirit of Coffeeneuring. As in any annual event, tradition thrives quickly and dies hard. Change is scary, but it seems that people achieved the goals, disaster was averted, and coffeeneuring as we know it (CAWKI) has not fallen from the Earth. 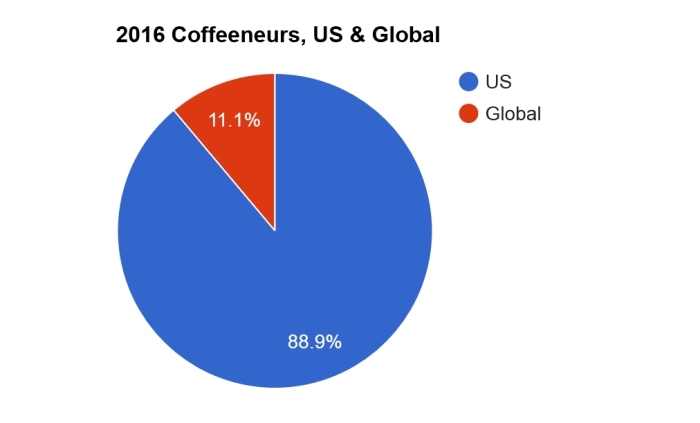 Bravo, well done, fellow coffeeneurs! 306 cyclists completed the 2016 Coffeeneuring Challenge. For context, here are completion numbers for each of Coffeeneuring’s Six Years. Nice growth curve! Who are the men and women of coffeeneuring? 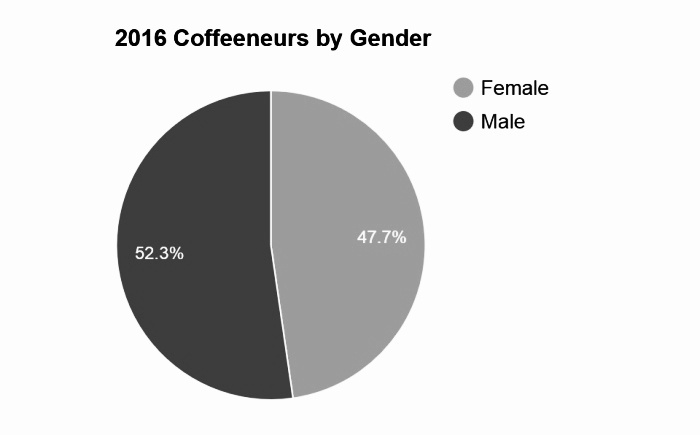 We continue to see coffeeneuring reflecting the gender diversity of the general population to a greater extent than many cycling events. 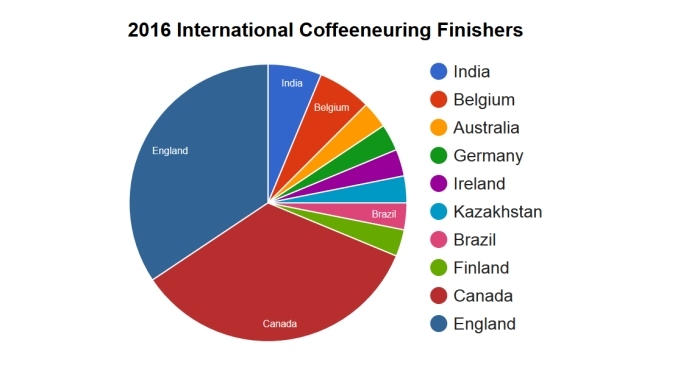 We also see a growing international contingent of coffeeneurs, including the first finishers ever from Brazil, India, and Kazakhstan. And someone in Tasmania successfully crossed the Coffeeneuring Challenge finish line this year, too. I’d like to give a special shout out to the coffeeneurs of Annapolis (three finishers) and Severna Park, Maryland (four finishers) – two small adjacent communities along the B&A Trail that together represent as many coffeeneurs as Seattle, Washington. Three cheers to Severna Park and Annapolis! 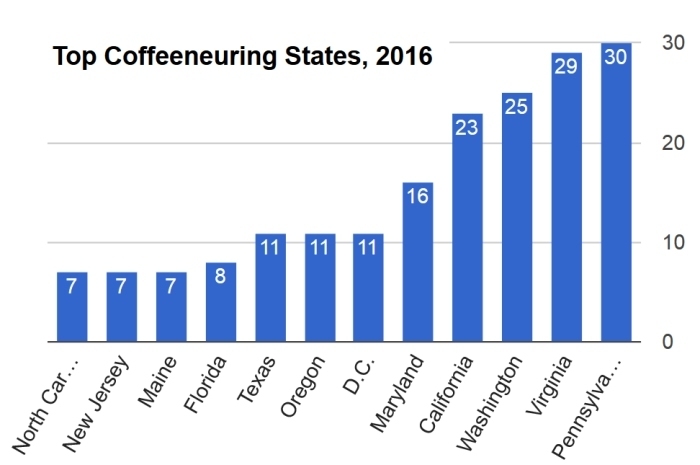 Words can be limiting, and the Northeast Regional Office of Coffeeneuring has made some great maps to graphically depict where people coffeeneured this year. Be sure to check them out. Many thanks to the Northeast Regional Office for all the help again this year! Five coffeeneurs have perfect attendance at the Coffeeneuring Challenge, completing it every year since the challenge began. They are known on Twitter as: @dailyrandonneur, @dirteng, @GeorgeSwain, @tangobiker, and @VannevarB. Thanks to everybody who embraced the Spirit of Coffeeneuring in 2016. Next year’s challenge will be announced in these pages sometime in the fall. 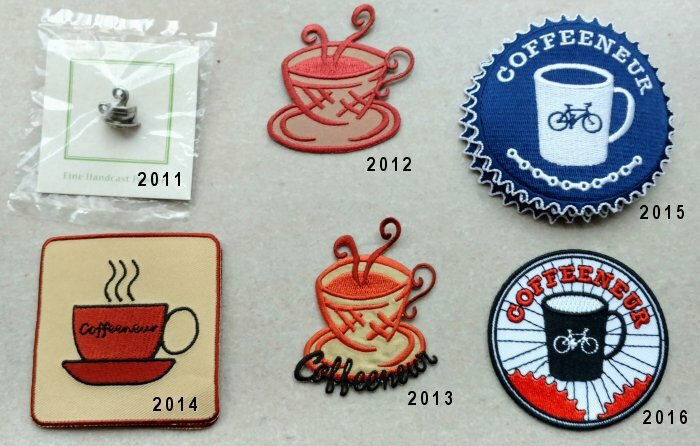 In the meantime, remember the Always Be Coffeeneuring Club is always accepting new members – with patches still available for a mere five bucks – and the only rule is that you like to ride a bicycle in pursuit of a coffeeneuring-like beverage! 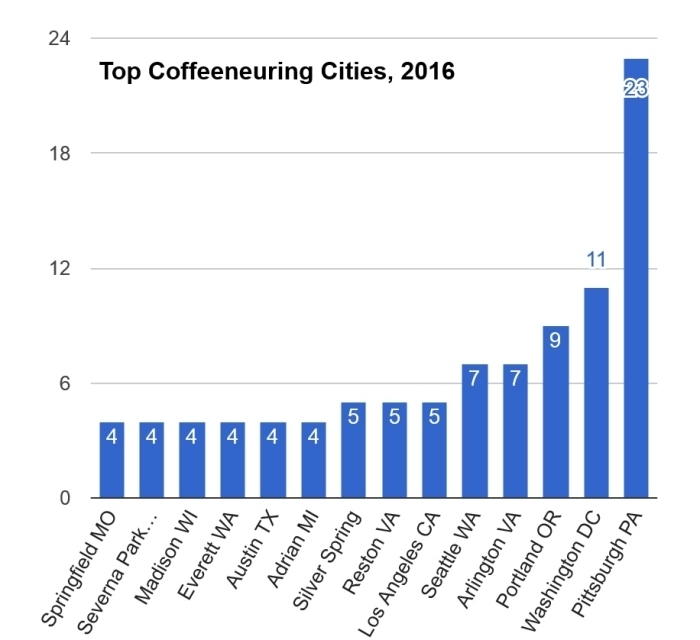 Again, thanks to everyone who took on the Coffeeneuring Challenge in 2016! Really surprised and mpressed that UK is right near the top of the table as I knew it was popular in the States but not here. Congratulations to all who take part. to promote it in our area next fall — you know, with unique photo opps, special coffee, etc. May even share this post with them. Great inspiration to get out there and RIDE (as well as enjoy local coffee) Thanks again. My first was 2014. Wish I had started the year before as I love that patch! But I do love all my “hard earned” pathches ;’-). What a great idea Cheryl, to get local shops on board. Thank you Mary for gathering all of us together for such enjoyable challenges, thank you Vannevar for all these beautiful graphics.